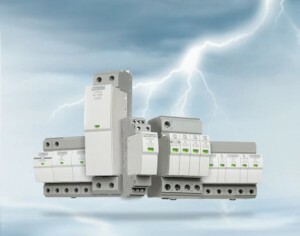 Safe Energy Control (SEC) technology from Phoenix Contact is the basis for durable and powerful lightning and surge protection. The revolutionary new design of spark gap safely prevents any line follow current. This protects your system, including fuses and arresters. For most applications, this means that a separate arrester backup fuse is no longer needed. The 1st line follow current free spark gap. The only pluggable spark gap for 440 volts. The only pluggable T1 arrestor with an integrated backup fuse. The only T1 + T2 arrestor at only 36mm per pole. The smallest pluggable T2 arrestor available today. The only T3 arrestor suitable for DC applications that does not require a backup fuse. A back up fuse free solution for any application. The only arrestors with full testability with the new CHECKMASTER test kit. Free replacement plugs for 5 years. The protective devices function without reacting, which enables the system to continue to run without being affected, even if the protective devices are active. This also means there is a lower overall load on the system and on the protective devices themselves. As the protective devices are particularly powerful and high quality they have a long service life which reduces maintenance costs. Customers will receive a free replacement if a protective plug fails with 5 years. Additional arrester backup fuses are not required. The customer has more room in the control cabinet and saves material and installation costs. Also, cable lengths required are reduced and the protective effect is increased. All products are very compact, hence the space requirement is reduced. All products are plug and play, so all plugs can be removed for insulation testing and can also be easily replaced without disturbing the cabling.